For the mountain climbers that come to Yellowstone, Mount Washburn is always on the top of the list. 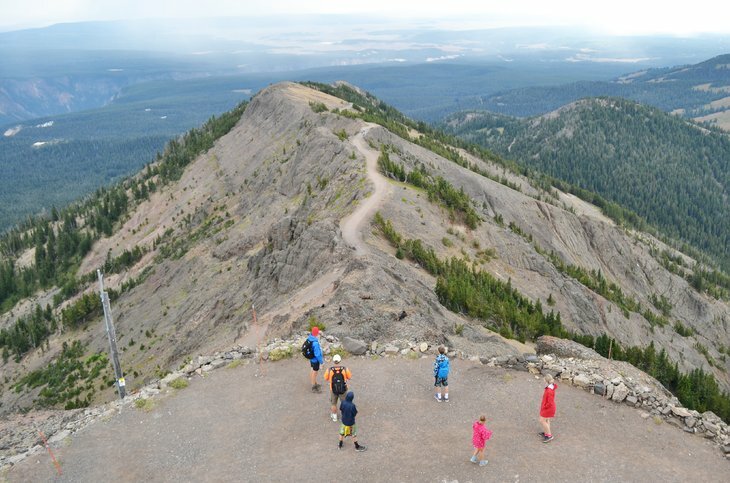 Accessed from the Dunraven Pass parking lot, just north of Canyon Village, Mount Washburn provides a healthy climb, great views, and an interesting glimpse into the park’s ongoing history with forest fires. The 6.8-mile round-trip up and down Mount Washburn follows a Forest Service road, slowly exposing great views of the Grand Canyon of the Yellowstone, Hayden Valley, and Grand Teton the entire way. At the top of Mount Washburn, a working fire tower roosts at the peak, where a park ranger is most likely watching for fires as you visit. Space is reserved in the fire tower for visitor information and binocular stands, which serves as a great resting spot before heading back down the mountain.